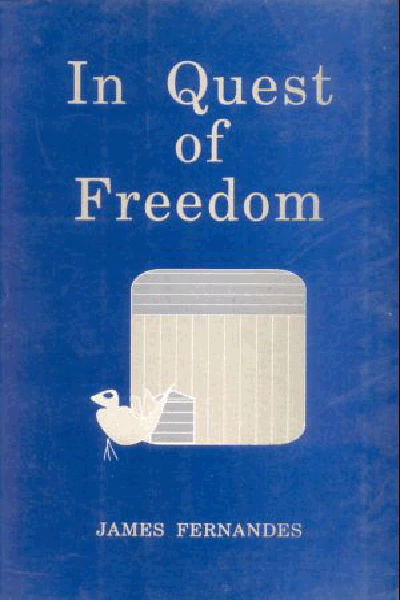 In Quest of Freedom, though it purports to be primarily an account of personal experiences of the author, is more than that. In Quest of Freedom provides glimpses into various aspects of the non-violent struggle launched in Goa since August 1954. It sheds light on the reign of fear that prevailed in Goa after that, and the police brutalities against the freedom fighters. The author succeeds in presenting the account as a struggle of the free human spirit against the powers of tyranny. The book is a testimony to the idealism that moved a generation of Goans of those times. Very striking is the capacity of the author to see the good points even in the Portuguese police and to display a sense of humour in describing situations that would normally be painted in a somber style. James Fernandes was born in Goa in 1933, and spent his childhood and boyhood in the village of Assonora. He joined the Goan freedom movement sometime after completing his school studies. In March 1955 he was arrested and sentenced to twelve years of imprisonment. He spent a period of four years and five months in Portuguese jails, most of it in Aguada Fort Prison. After his release he went to Bombay and resumed college studies. For the past twenty-three years he has been teaching English literature in St. Xavier College, Mapusa. He lives with his wife and five children in Assonora, Since the liberation of Goa he has kept himself all of from all politics, confining his interest to reading, teaching and a little farming.